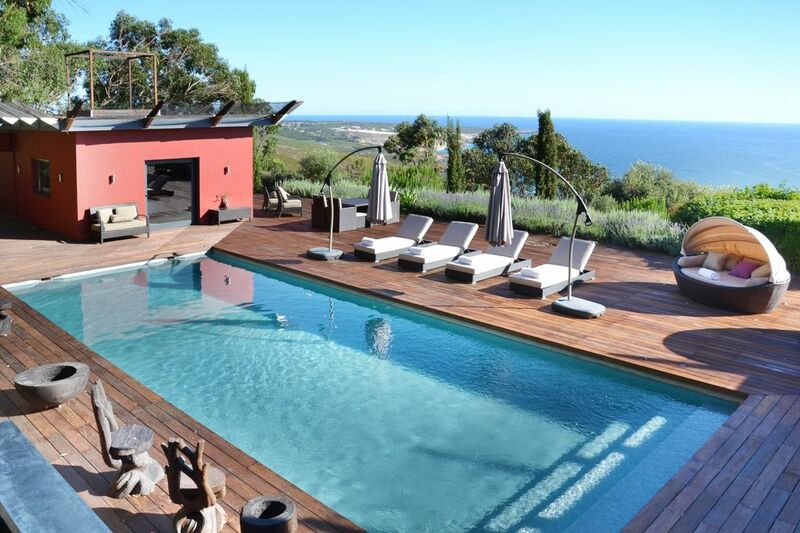 Luxury villa for 14 guests, in Cascais, with amazing views over the ocean! Villa Zenith is a high-end villa for 14 persons in Cascais with stunning sea views. This amazing property showcases an interior with spacious and ample areas furnished with modern and sophisticated amenities. On the exterior guests can find a massive heatable swimming pool 12 m x 5 m, comfortable sunbeds on the deck around the pool, outdoor dining area, barbecue and a garden with big trees surrounding the villa, providing a sense of tranquillity and privacy to the holidaymaker. Located in a quiet area with heavenly sea views, this villa is the epiphany of relaxation. The alluring Sintra with its beautiful palaces and ancient castles, or the charming centre of Cascais can be both reach within a couple minutes by car. And because this area is known to have an amazing coastline, the Guincho beach with its golden sand and crystal-clear water is just a short drive away. Cascais and Sintra (UNESCO Heritage) offer some of the best sea-side bathing and water sports in Portugal, depending on the type of beach you choose. More or less exposure to the Atlantic Ocean means more or less crowded beaches and different water sports. We recommend the coast along Estoril for sheltered beaches and from Cascais / Guincho to Praia das Maçãs for wilder conditions. In Quinta da Marinha, you'll have access to an 18-hole championship golf course (by Robert Trent Jones) and close by, the Oitavos Golf Course (by Arthur Hills), the 18-hole course included in the 100 best courses in the world. In September 2011, Oitavos Dunes jumped 20 places to be considered the 68th best course in the world and the second best in continental Europe. In the resort you have also 10 short tennis (two synthetic grass & eight in clay), 3 short padel, 3 squash / racquetball courts, sauna, gym, indoor swimming pool, restaurants and the Marinha Equestrian Centre, considered one of the largest and most well-equipped of the Iberian Peninsula. Lisbon, Portugal’s capital, a romantic and cultural city, known for its amazing light, is located over seven hills and bathed by the Tagus River. Its history goes back before Roman colonisation and you can still find traces of the different civilizations and cultures that graced this land. The picturesque and medieval streets of Alfama, Bairro Alto and Chiado, where one can hear the Fado at night, a unique synthesis of old and new, is a must. Splendid monuments, castles and astonishing sights “miradouros” keep you company every step of the way. There is a large range of activities to do and places to see in Lisbon, like the Oceanario, Europe’s biggest aquarium, alone worth the visit for its perfect picture of ocean wild life. This city also offers an abundance of distinguished restaurants, fantastic shopping and great nightlife. To the west of the city lies mysterious Sintra, a verdant cultural landscape - declared by UNESCO as a World Heritage. After 24 hours of traveling with 8 kids, we arrived to no hot water and a promise to fix it ASAP. Up until the day we left, we were completely disappointed. Some of the people in our party did not take a shower at all for 5 days. I am one of those people. I had to use the pool for a refresh, which left dry chlorine skin that I had to deal with. Every day we went out on tours we were promised hot water on return. No such luck. I really wish I could upload screenshots of the texts between me and the Villa Manager as well as photos of the toilets. Two of the toilets flooded and we were not able to use them. We were told a Plumber was coming, and we still did not get a Plumber. When we left, the toilets were still flooded. The whole house smelled. That was inconvenient and unsanitary. Germs were all over the floors. I now have a 7 year old child who requires ointment between his toes. I understand that some things take time, but how can we not have a Plumber in 5 days? The toilets made the downstairs bedrooms especially smell like pee and poop. On the last night we got some hot water (but we had to go outside every time someone took a shower to restart the boiler, at 1am and 2am in the morning, with kids). Three people out of 14 got a shower in that night. The view is great. The house is beautiful but with some simple design flaws: the master bedroom shower floods the bathroom, if you are taller than 5 feet you can't close the door to the toilet as it knocks your knees, the knobs came off the doors and closets, the sliding glass doors don't all close (so make sure you close the shutters for safety), the toilets back up and leak. And the simplest most annoying thing? We did not have a kettle the whole time, even though we asked for one and was promised one on arrival. For a group of 14 tea drinkers. Photos are beautiful, but don't be fooled by them. 4 cars inside the gate. There were several items that needed repair - none so bad that it ruined our stay, but they were somewhat disappointing: pool deck has nails coming loose and we were advised to not walk on it without shoes, pool tiles are popping off, jetted bath tubs don’t work. Could not get stereo system to play our music. Management said these were going to be fixed. Thank tou for your review and your comments, we will send it to the owner. The villa will have improvements at the end of the season. Thank you for choosing our services and we are at your disposal for another opportunity. We had a wonderful time - the house is beautiful - we were 5 girls so each had our own room. I think we would also have been comfortable had we taken our husbands ie a party of 10. There is so much to see & do in the area as well. You can get onto the coastal path by following the road a 100 m and then set off for a hike. Barbeque was great. Yoga overlooking the sea was blissful. House has so many little / big seating areas and the garden is much bigger than you realise as it goes down the mountain side. There is also some rosemary and a peach tree in the garden too. House is a little bit tired and in need of a bit of TLC on the deck & pool tiles which I am sure will be maintained during the winter. The air conditioning in the main lounge wasn't working but we were provided with fans so it didn't bother us at all. In the separate bedroom suite off the pool deck - the aircon unit is behind the bed so one of our party didn't realise it was there and slept with windows opened (nice sea breeze but she got bitten by mosquitos). One of the bedrooms on the lower ground had a bit of a funny smell - again didn't bother us much but would suggest they look into it as I think it may have had a bit of damp. The managing company gifted us a couple of bottles of wine on our arrival which was really nice. They were also very quick to return the deposit (next day) which was very efficient. Be aware that cooking oil, salt & pepper, & other condiments are not provided so either byo or be prepared to stock up on some staples. The local Spa shop has everything you need and is a 5 minute drive. Best beach we feel was Prai D'Agrais....like a mini Durtle Door. Also has a little restaurant - but it is a steep drive down. The driveway is steep and if your rental car isn't great it can be a bit harrowing - we parked just in front of the gate as we felt safer that way. I would highly recommend this place and would definitely go back again. Thank you very much for your review and your comments! The owner is informed and will improve the villa at the end of this season. We are happy to know that you have enjoyed your stay and are at your disposal for another opportunity. Nicht jeder "Luxus" ist verfügbar! Die Villa entspricht der Beschreibung im Angebot. Ein besondere Lob muss ich Herrn Paulo Peres, unserem Hausverwalter, aussprechen. Er hat uns mit dem Haus sehr gut Vertraut gemacht, und hat uns hilfreiche Tipps zum Besuch in der Region gegeben. Leider musste er uns auch auf nachfolgende Mängel hinweisen. Es funktionierten viele Dinge, im und um das Haus, nicht. Das gravierendste war der Mangel an warmen Wasser. Wenn von uns drei Personen geduscht hatten, gab es kein warmes Wasser mehr. Die Villa ist in diesem Zustand nicht für 15 Personen geeignet! Ein Großteil der Lampen, im Wohnzimmer und in den anderen Zimmern und um das Haus, funktionieren nicht. Die Lichtsteuerung für die Treppen im Haus funktioniert nicht. Z. B. Schalet man das Licht für die Treppenbeleuchtung im Wohnzimmer aus, kann sie nicht oben im 1. Stock eingeschaltet werden. Nachts muss man im Dunklen die Treppe runtergehen. Sturzgefahr! Das Gleiche gilt für die Schlafräume in 1. Untergeschoss. Die fest installierte Außenbeleuchtung, für die Zugänge und die Treppen, ist außer Betrieb. Die Notbeleuchtung blendet so stark, dass die Treppenstufen im Dunklen extrem schwer zu erkennen sind. Sturzgefahr! In der Küche sind die Mikrowelle und die Fritteuse kaputt. Die TV-Geräte in allen Schlafzimmern funktionieren nicht. Einige Abflüsse in den Bädern sind verstopft. Im Fitnessraum ist eine Fensterscheibe defekt. Die Fernbedienungen für die einzelnen Klimageräte sind nicht auffindbar. Am Pool sind alle Sonnenschirme kaputt. Das Anwesen muss aus meiner Sicht, im Anbetracht des Mietpreises, dringen renoviert werden. Die Belegung mit 10 Personen ist perfekt !!!! Wir waren 12 Personen und man muss sagen, dass die dort aufgestellten Extra Klappbetten nicht für Erwachsene geeignet sind. Ansonsten ist das Haus wunderschön. Es ist toll eingerichtet, und man hat einen traumhaften Blick auf Guincho Beach. Sehr, sehr schön !!!!!!!!!! Cascais and Sintra (patrimony of UNESCO) offer some of the best seaside bathing conditions and water-sports in Portugal, depending on the kind of beach you choose. A higher or lower exposure to the Atlantic Ocean means more or less crowded beaches and different water sports. We recommend the coast along Estoril for sheltered beaches and from Cascais/Guincho until Praia das Maçãs for wilder conditions. Inside Quinta da Marinha resort you have access to an 18-hole championship golf course (by Robert Trent Jones) and just beside you have the Oitavos golf course (by Arthur Hills), an 18-hole course included in the top 100 courses of the world. In September 2011 Oitavos Dunes jumped 20 places up the list to be considered the 68th best course in the world and the second best in mainland Europe. Inside the resort you have also 10 tennis courts (two synthetic grass & eight in clay), 3 padel courts, 3 squash/racketball courts, sauna, gym, indoor swimming pool, restaurants and the Marinha Equestrian Centre, considered one of the largest and most well-equipped of the Iberian Peninsula.